Our homes are naturally smart and inventive. They aren’t technologically smart and innovative though. We need to add some smart and tech-rich gadgets to make them smarter and way more innovative. Some of the most innovative gadgets we can add to our homes to enhance security and overall home performance is video doorbells. Smart doorbells are handy devices that serve as the first line of defense for home and business owners. They wirelessly connect you to the outsiders ensuring you can familiarize with those in the front door before you allow them in. The ring is a key player in the video doorbell making industry. Their products are smart and highly innovative. The Ring video doorbell is here for you and that is why it is a great choice. 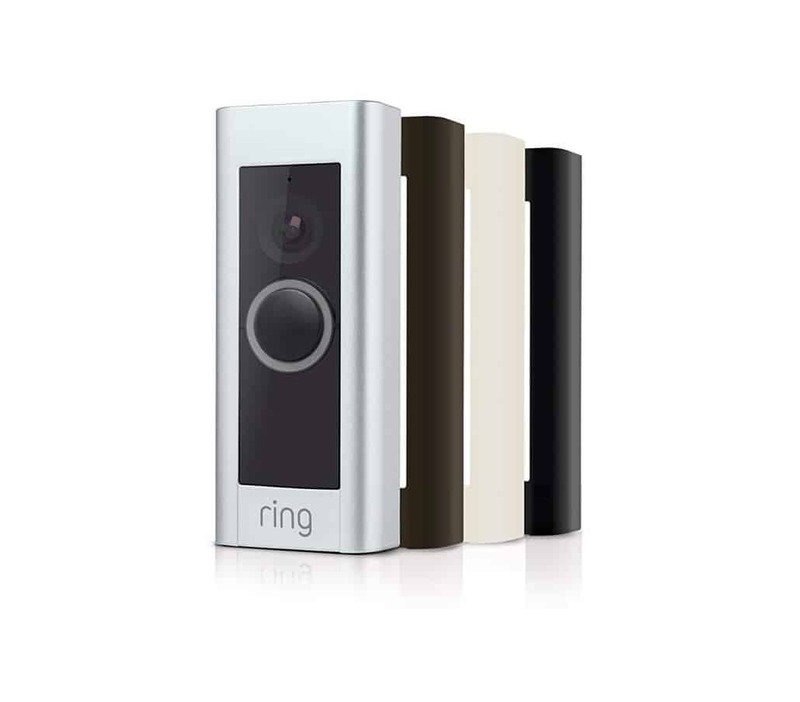 The ring video doorbell has a slim and more standard-like design. It measures 1.8 inches wide, 0.8 inches deep and 4.5 inches high. It comes in multiple faceplates which include bronze, white, black, and nickel. The ring has additional features like extension wires, screwdriver, anchors, well-illustrated guide, screws, and wiring kit. It provides a huge vision field of 160 degrees at an amazing video stream quality of 1080p. The 3 high-end infrared LEDs provide strong lighting ensuring you can see more than 30 feet away. With the built-in speaker, chime, microphone, and motion sensor you able to detect motions and inquire about the presence of a human being before you finally open the door. This amazing video doorbell is compatible with wireless connections rated at 2.4GHz and 5GHz. This clearly means it can work perfectly with almost of sorts and sizes of routers. It must be connected to a two-wire power source to work. On its face, this doorbell has a camera and button two of which sit in the midst of blue LED glow. The setup button sits on the right section of the device. The doorbell is constructed such that it will produce a chime when the doorbell button is pressed. Pressing the button actives the camera and makes it start recording-essential information that will be sent to your smartphone in form of a notification. The only problem with the ring is that for you to access the videos, you must subscribe to any of the monthly packages. To conveniently operate the ring doorbell, you should get the ring mobile app for android and iOS. The app works in such that once you launch it; it will redirect you to my devices giving you full access to all the ring devices installed in close proximity. The bottom of the app provides detailed info of all the historical events including motion triggers, view requests, and rings. You check out the events as listed, view, and watch the content. There is also the chimes option where you can check out the doorbell ring chime. When you check on the device health, you will get to know about your system status, Wi-Fi strength, and voltage settings. The motion settings menu enables you to adjust the motion zones and sensitivity for you to receive notifications when necessary. Other common features in the app are motion snooze, shared users button, and select Ring+ option. The motion snooze enables you to deactivate alerts for some time, the Ring+ enables you to link up to other smart home systems while the shared users’ button enables you to add up people you want to be receiving videos and notifications. Ring video doorbell comes with clear and easy to follow instructions. Installing and operating this device is simply easy. You don’t need to hire a professional to help you install this doorbell. With the aid of the setup guideline videos on the mobile app and the provided user instructions, you can comfortably and easily set up all the wiring and screws. There are also simple and detailed instructions on how to replace an old doorbell. Check out the app and user manual to read the instructions and follow them keenly to easily remove the aged doorbell and install the new one. To start with, you have to get the app installed in your smartphone and an account created. After you done, choose your name and hold on the button to check out if everything is okay. Once done, enter your Wi-Fi details to link up to your networks. This will take you not more than two minutes. With the ring video doorbell, you will be getting quality and sharp 1080p videos both at night and during the day. The ring video doorbell is strongly constructed and fully packed with the necessary features to guarantee maximum safety to your house. It’s simply easy to set up and does not require any complex skills to install. It includes a range of amazing faceplates and boasts of a sleek design. With this doorbell, you will be getting high-quality 1080p feeds regardless of the time you are viewing. It is a worthy doorbell to invest in. Remobell is no doubt one of the best brands of doorbells you can get in the market today. It offers you the safest and most effective way to watch over your front porch while seated comforted in your couch. Let’s look into the details of Remobell to help you better understand its operations and functionality. Measuring 2.7 inches wide, 1.2 inches deep, and 6.0 inches tall, the Remobell video doorbell is a bit larger and heavier. Enclosed in a black weatherproof silver insertion, Remobell doorbell sits in the midst of a strong LED ring. The ring pulses blue and glows uninterruptedly when you press on it. On the back side of the glossy enclosure is an inactive infrared sensor that senses the body heat to help in motion detection. It as well comes with a built-in 720p camera, light sensor, two powerful infrared LEDs and a microphone. On its bottom sits a large spacing that can hold 6 AA batteries, reset button, and a speaker. The batteries are powerful enough to run the doorbell for 4 good months before they require replacement or recharging. Also included are mounting screws and brackets. Remobell links well with almost 2.4 GHz Wi-Fi network and performs well with almost all android and iOS devices. It works by producing a loud but nice chime which plays through the app. It works automatically to generate a video stream showcasing who is on your front porch. The best thing is that you can decline or accept the doorbell chime. When you accept the chime, you will have the option to use the 2-way audio speaker to communicate with the person on your doorstep. The best interesting thing about Remobell is that it records the video and uploads to the internet for storage regardless of whether you accept or decline it. As with Remobell, you will get 20 full days of free cloud storage. Once the 30 days have expired, you will have to renew the package by paying for any of your preferred packages. The payment caters for unlimited cloud storage hence you shouldn’t be worried spacing. It’s quite unfortunate that Remobell doorbell doesn’t provide on-demand video. It as well cannot be connected to other smart home devices and systems. It is a standalone device that does not support other devices. Its mobile app gives you full access to all the most recent activities ensuring you can check out your past events of declined, answered, and missed rings. With all the events recorded on the app, you will know the exact date and time when the video was recorded as well the small thumbnail images. The thumbnails are versatile enough to be easily played, downloaded, shared, and deleted when the need arises. The Settings Menu is located on the top on the left corner. It is represented by a 3-bar icon. With the settings menu, you can easily view and edit your account info, check battery life, adjust sensitivity settings and video as well as manage the push notifications. 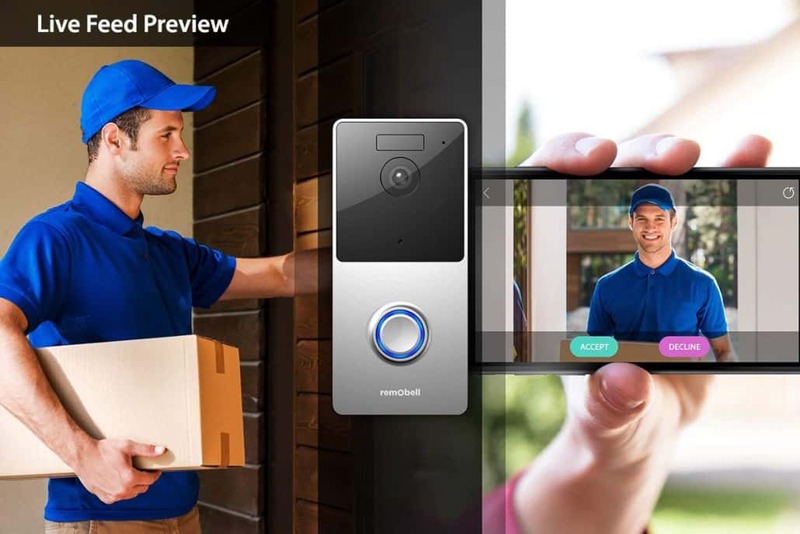 If you aren’t tech-savvy and wouldn’t want a smart video doorbell that would require you to invest so much time and money on installation, then Remobell is your best solution. After the packaged is delivered to your doorstep, you can easily set it up and get it working in no time. After you have installed the device, you can then install the batteries, download the app and then create a personal account. You have to keenly follow the instructions as given in the app to link your device to the SSID. Once done, connect it to your Wi-Fi network and key in your Wi-Fi password. As long as everything is done correctly, you will be ready to go within minutes. Always make sure that you mount it in the most convenient and strategic place in close proximity to your front door. Remobell is known and highly preferred for delivering premier quality video feeds that are not only sharp but also rich in color ensuring you can comfortably watch them during the day and at night. The only problem with this doorbell is that it hangs making it a bit hard for you and your visitor to have a successful conversion. The audio quality is as well not as good and may need some improvements. It works seamlessly by sending push notifications once the bell outside is pressed or senses some motions. The best thing is that when this doorbell sends notifications, it also creates a video clip for them and sends directly to your smartphone. 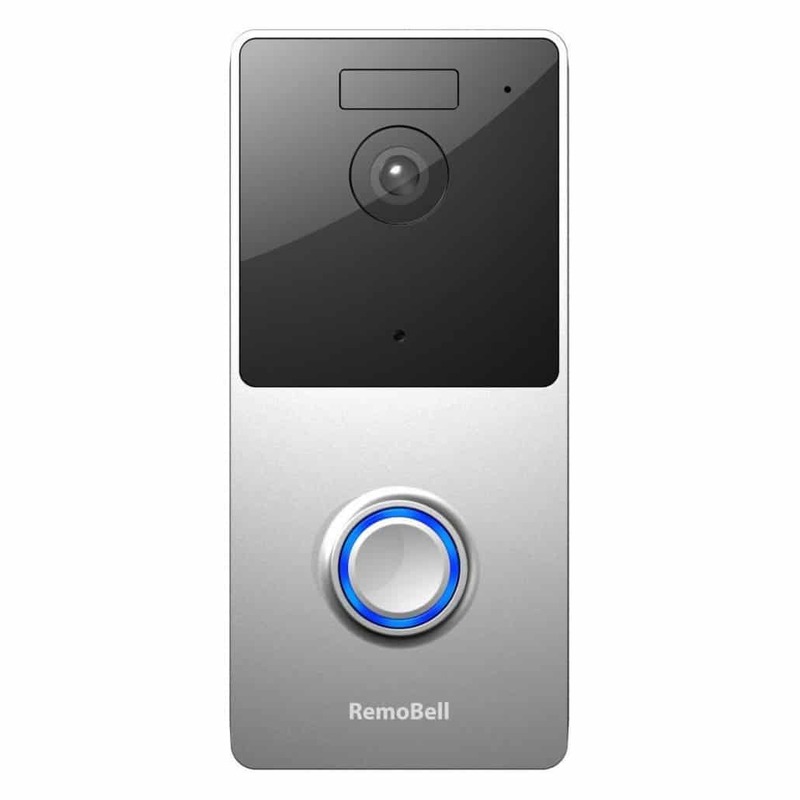 The Remobell is one of the best smart video doorbells you will ever find in the market today. It is the ideal doorbell solution for those who aren’t tech-savvy and don’t have all the time on earth to spend setting up complex doorbells. It delivers high-quality 720p videos that can be comfortably watched during the day and night. It as well sends notifications to your smartphone once motion is detected. But then, just like all other smart video doorbells, it is not completely perfect. It needs some improvements especially on the quality of the audio produced and the accuracy of the video presentation. Also, you cannot link it up with your other smart home systems since it is a standalone device. It is, however, affordable and will offer you value for money. If you have researched the smart video doorbell market well, you will agree with me that Ring vs Remobell are great choices that are selling quite well recently. With so much sophistication in front porch monitoring systems, you have to be smart when choosing. These gadgets are expensive and choosing the wrong ones can leave a permanent mark on your bank account. As we have said above, for those who want quality and value for money, Remobell and ring are the perfect choices to consider. They will help monitor your front porch and minimize the chances of criminals attacking without your knowledge. Overall, Remobell is a great choice that promises to keep your home safe. It does not require you to be a professional in order to install and operate. It, however, has some disadvantages that make it not the ideal choice for everyone. As for the Ring video doorbell, it is a featureful and reliable choice that offers you everything in place. It connects well with all home smart systems and devices. So you can link it up with your home smart systems to ease usability and convenience. 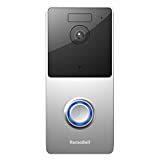 To conclude, if you are in search of a convenient and easy to install doorbell solution, the Remobell will be the perfect choice for you. But if you are searching for the greatest and most advanced choice, the Ring video smart doorbell will be the sure bet for you.